Praise the Netflix gods, for they have bestowed upon us the second season of AMC’s The Killing, now available on InstantView. I live in a cableless household, so I eagerly await that moment when my favorite programs release their recently finished seasons. 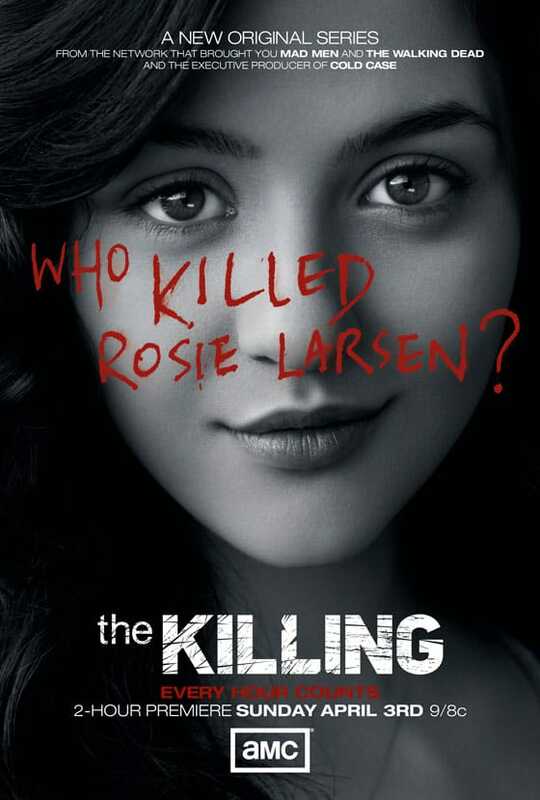 The Killing has been on my watch list for new episodes since I wrapped up the first season about six months ago. I’m now moving through season two at a brisk pace, much like the young couple in Portlandia that voraciously consumes Battlestar Galactica to the detriment of all other obligations. The Killing has been especially addictive for me since it combines the whodunit thriller with a procedural crime drama. In short, if Twin Peaks and The Wire got together and made a baby, The Killing would be the child. Image from Welcome to Twin Peaks.com. The series begins with the death of Rosie Larsen, a beautiful Seattle teenager from a seemingly typical middle-class family. 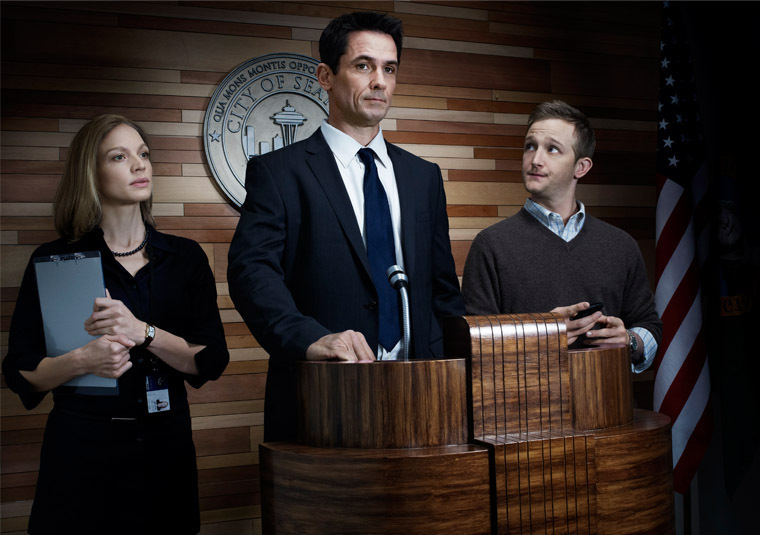 Detective Sarah Linden (brilliantly performed by Mireille Enos) reluctantly takes on the case despite her best efforts to sever ties with Seattle PD so that she can relocate to California to be with her fiance. The taciturn detective reluctantly partners with Stephen Holder (perhaps the strongest performance, by Joel Kinnaman), a younger detective recovering from drug addiction and willing to bend the rules to get information. The two become quickly absorbed in their investigation, which leads them to investigate the Mayoral campaign of a young city councilman as well as Rosie’s own family. These investigations slowly reveal the moral failings of all associated and hint at the various influences that may have placed Rosie in a position of vulnerability. As a result, The Killing undermines the myth of the American dream by presenting it as facade. Notice that both shows investigate the death of an attractive, middle-class teenage girl. Both shows’ detectives investigate all aspects of the community in which that girl lived. In both cases, detectives find that their victims’ lives may not have been as wholesome as they thought. Laura Palmer and Rosie Larsen both associate with individuals who deal drugs, pimp prostitutes, and facilitate gambling. Even geographically, Twin Peaks and The Killing share the same setting in common, with both stories located in the Pacific Northwest, though granted, The Killing‘s urban focus differs drastically from Twin Peaks’ folksy rural town of the same name. That’s where The Wire‘s DNA becomes a factor. Like that crime drama, The Killing explores the connections between city bureaucracies as does The Wire, which meticulously presents the investigation of Baltimore drug gangs by a special investigative unit. We also see corruption in government that rivals the criminal elements also presented in the show. Season 3 of The Wire in particular parallels The Killing by incorporating character Tommy Carcetti into the show’s narrative. Carcetti, like city councilman Darren Richmond in The Killing, is the quintessential charismatic young politician trying to climb the ladder in city politics. Both struggle to negotiate between their ideals and their desire for political success. At the same time that each shows’ investigations reveal the seedy underbelly of the American dream, the shows’ political subplots similarly suggest that the American political system has a dark side too. Mayoral candidate, Darren Richmond, flanked by his two closest political aids in The Killing. Image from Fanpop.com. 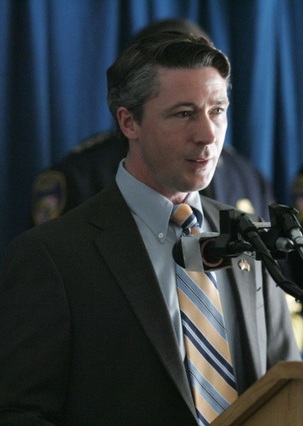 City Councilman Tommy Carcetti in The Wire. Image from Soundpolitics.com. Of course, The Killing has just as many differences as similarities with Twin Peaks and The Wire. Its serious tone and realist aesthetic dramatically contrast the humorously melodramatic Twin Peaks, while it’s plot-driven narrative full of twists and turns feels convoluted in comparison to the slow unfolding that happens in each season of The Wire. Furthermore, The Killing presents some of its characters as unredeemable villains, differing drastically from The Wire’s humanistic approach to morality. I was especially appalled with the way The Killing presents a group of powerful leaders at an Indian Casino as a veritable gang of thugs intent on manipulating officials by insisting on their sovereignty. But these very differences reinforce my point: The Killing combines the elements of an urban crime drama with a family melodrama and a political thriller to produce a narrative all its own. Within the American context, the resulting narrative operates as a critique of American ideals, exposing the lies that undergird them through the death of one girl. You may already have heard hype about Searching for Sugar Man, the winner of this year’s best feature-length documentary award. The film follows several South African fans of the seventies American folk singer, Rodriguez, as they uncover the story of this largely unrecognized talent. But the film doesn’t just explore the story of this amazing artist; it also demonstrates the ways in which an artist’s persona can align with a sense of place through its investigative format, formal elements, and the music of Rodriguez itself. Promo for the film. Image taken from LondonFilmFanatiq.com. As the film’s title suggests, Sugar Man portrays a search for the location of Rodriguez. In the process, the film initially presents a sad story of a failed artist. Rodriguez released just two albums, Cold Fact and Coming from Reality, in 1970 and 1971 respectively. Neither album sold well in the United States, but Rodriguez’s work found an audience in apartheid-era South Africa. The film portrays the ways in which the political economy of seventies South Africa enabled Rodriguez’s popularity there without the artist’s knowledge of his own success. We see the repressive regimes of the conservative National Party, which censored Rodriquez’s work, making it all the more attractive to youth of that era. The film suggests that young, white South Africans found inspiration in Rodriguez’s work, prompting some to even protest the abhorrent apartheid policies of the era. In this section of the film, we see how Rodriguez’s work becomes connected with this era for this group of fans. The filmmakers reinforce this connection with beautiful shots of South African scenery whilst playing tracks from the Rodriguez catalog. We also hear the recollections of the fans, who describe their experiences of listening to this music and all of its associations with their experience growing up at that particular time and place. We get nostalgic home videos, news reports of protests, and stills of that period. In short, we see how fans connect the music they listen to with the time and place in which they listened to it. But like Detroit, which news outlets and politicians frequently eulogize, Rodriguez persists, defying the myth of his gruesome public suicide. Rather than the embittered, shell of a man that so many would-be rock stars become when they fail to find a mainstream audience, Rodriguez appears to be a fully-actualized person. He seems comfortable with his position in life, taking pride in his work, both artistic and manual. Along these lines, Rodriguez’s daughters poignantly describe their upbringing, depicting a man of dignity who advocated for what he believed despite failing to achieve socially-recognized success. So while Sugar Man revels in the spectacle of Rodriguez’s first visit to South Africa with sold out stadium-sized crowds and classic acts of fan adoration (throwing bras on stage, seeking autographs, lighting up at the mere sight of the artist), Rodriguez’s zen-like calm and embrace of each moment’s pleasures sets him apart as a subject for a rock documentary. It may be Rodriguez’s ability to connect with his audience in this way that enables him to so easily become the soundtrack for places as far flung as South Africa while at the same time representing the Motor City in both sound, lyrics, and personal history. Searching for Sugar Man, then, ends up demonstrating how great art manages to be both quintessentially of its time and place while at the same time transcendent. Of all the films I watched last year, We Need to Talk About Kevin proved to be my favorite in the horror genre. Some might challenge that label: the director, Lynne Ramsey, never helmed a slasher flick or monster movie, but instead displayed a unique aesthetic with her debut film, Ratcatcher, which portrays a young Scottish boy, striving to escape his gritty existence in 1970’s urban Glasgow (see my overview of the film here). Nevertheless, both Ratcatcher and Ramsey’s second feature-length, Morvern Callar, both deal in dark themes of death and existential crisis, despite their “art house” credentials, with both films’ primary protagonists’ coping with a violent death through most of (if not the entire) film. We Need to Talk About Kevin, however, deals with death of a different sort. Whereas Morvern Callar starts with the aftermath of the title character’s boyfriend’s suicide, and Ratcatcher’s James struggles to process the accidental drowning of a young friend, Kevin focuses upon Eva Katchadourian (played brilliantly by Tilda Swinton), a formerly vibrant travel writer reduced to a hollow shell of her former self. Through a series of situations in the present and flashbacks to the past, we learn that Eva’s son, Kevin of the title, committed a terrible act that continues to haunt her in the present. As he grows older, his hostility becomes more overt: he resists toilet training, glaring at Eva with great intensity while intentionally defecating just after being changed. In this particular incident, Eva loses it, handling Kevin roughly and accidentally breaking his arm. Kevin uses the incident to manipulate Eva, reminding her about the injury when she initially refuses to take him to a toy store. Eva relents, knowing Kevin could easily tell his father about the real cause of his broken arm (he lied to to his dad about the incident, presumably to gain leverage over his mother). We then see Kevin in his teens, continuing the same pattern of defiance. Kevin could be a case study in violent psychopathy. Just prior to seeing Kevin, I read Jon Ronson’s The Psychopath Test, which humorously details the history of psychopathy as a diagnosis. Individuals suffering from psychopathy fail to feel any sense of empathy or genuine emotional connection, even with their closest relatives. Instead, a psychopath sees such relationships in opportunistic terms, manipulating those around him for his own gain. Nevertheless, psychopaths often exhibit a kind of magnetic charisma that can be mesmerizing to those who are unaware of the duplicitous nature of the act (see also Martha Stout‘s The Sociopath Next Door). Throughout Kevin, the title character illustrates these characteristics, simultaneous charming his father while at the same time playing games with his mother. As these stills show, the film uses red in a variety of contexts. Red literally covers Eva as she revels in the experience of a tomato fight in the film’s first shot. It’s also the color of the paint that Kevin splatters all over her map-papered office walls. In short, red represents Eva’s passions as much as Kevin’s resentment of those desires. It also casts a haunting glow over the film’s present, in which Eva copes with the aftermath of her son’s violence. Red, then, is the color of guilt. This guilt makes Kevin so compelling as a portrayal of mothering a psychopath. The film shows Eva at every turn struggling with choices that many professional-class mothers must make: whether to continue a career or forego it, whether to live a metropolitan life or go suburban, whether to have an additional child or focus on the one you have. At each turn, Eva makes the conventional choice in spite of her own desires, but still faces her son’s ire. At every turn, Kevin plays upon Eva’s guilt to evade punishment for his own bad behavior. Eva alone recognizes her son’s true nature, but fails to take action because she feels responsible for it. Kevin, then, is less about the horror of Kevin’s final violent act and more about the burdens placed on mothers in contemporary society. Kevin’s psychopathy merely brings these tensions to light more dramatically than a typical family drama, but in doing so defies the tendency to easily resolve such conflicts. In this way, the filmmakers of Kevin use the generic elements of horror along with sophisticated cinematography and fine performances to portray the complexity of mother-child relationships in contemporary, middle-class households, to devastating effect.